Usually when I explain what KBA (knowledge-based authentication) is most people think it’s really cool. Even though KBA solutions have been around since early 2000, the reality is businesses using this technology are considered early adopters – mainly because consumers (and the media) are only starting to become aware of KBA and how it works. 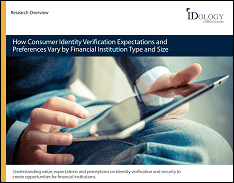 Identity–proofing services will become increasingly important for fighting fraud and building online reputations. Personal identity frameworks, such as Microsoft’s CardSpace and OpenID, will also spur adoption, because these frameworks will be used for high-assurance applications. But what about the creepy factor…are KBA questions an invasion of your privacy? At IDology we believe KBA in fact protects your privacy by limiting what data is being exposed to businesses. Instead of having multiple companies and employees access and review all of your data records, we shield your information and ask non-invasive questions that link you to your history. Based on the fact that our clients see an increase in customer satisfaction when using KBA, I’d say most consumers find it cool too. After all, wouldn’t you rather answer a few questions about old addresses or cars than provide your social security number or driver’s license number?